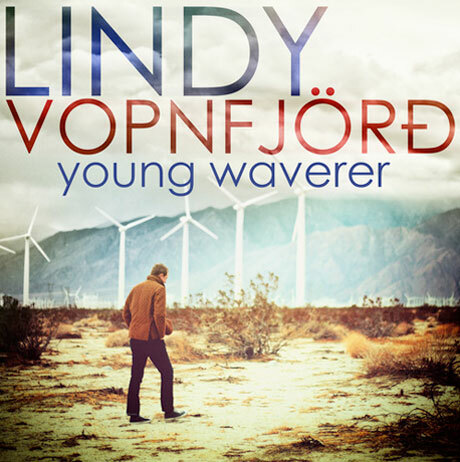 Lindy also has a bunch of release shows coming up, including TONIGHT at the Horseshoe Tavern in Toronto as part of the New Music Tuesdays, he is on at 10pm sharp, his backing band is MAJOR MAKER, and it is a FREE SHOW!! … and to top it all off, Lindy and his wife Sally are having their first baby in May 2013, we are so happy for them both! 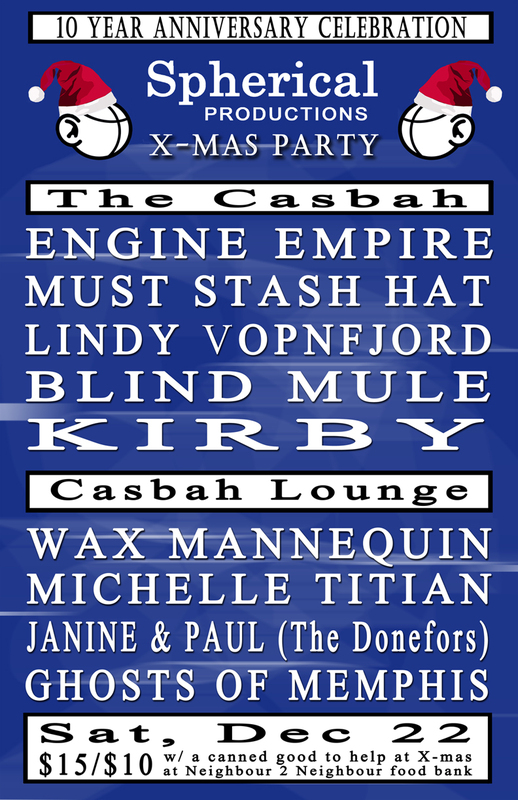 Spherical Productions 10 year anniversary / X-mas Party!! Spherical Productions is celebrating being in business as a independent booking agency for 10 years, booking over 100 tours exclusively in our beautiful country of Canada, representing over 60 acts since 2002, getting a grant through the Canada Council of the Arts for the first time this year, to help continually grow SP into the future, and SP won the honors of ‘Booking Agent of the Year’ at the Hamilton Music Awards this year, so to celebrate a great year, SP has put together a stellar line-up of great acts as part of their annual X-mas Party, booking up 9 acts in 2 rooms, and we are stoked about this show! We really hope all you music lovers can make it out for this musical celebration before we celebrate with family over the holidays! 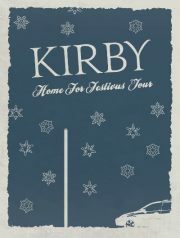 Kirby is touring home for Festivus!! 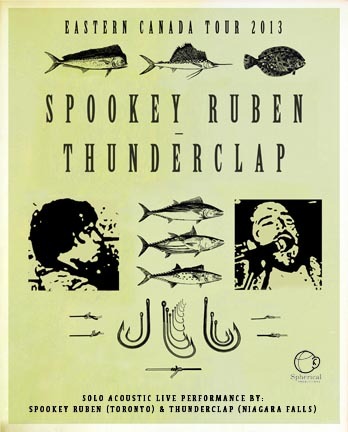 This December Kirby is taking his stories and songs across Canada on a feat of strength. With just an acoustic guitar a Ford Focus Station Wagon and songs to share, you too can celebrate this wonderful Festivus and share in all the stories he encounters along the way. Come home with Kirby, Home For Festivus. CA Smith wins Alternative/Indie Rock Album of the Year at the Hamilton Music Awards!! CA Smith was once known as Mayor McCA, the one-man band singing sensation, and as of earlier this year, he decided to become a singer/songwriter, and put away all of the many instruments he played at once, and since his change of musical directions, he has toured Canada twice, played the infamous Supercrawl Festival, and he has just won the Alternative/Indie Rock Album of thet Year at the Hamilton Music Awards, way to go CA, you deserve all the best because of how hard you work for your art as a musical icon to many. We are proud to announce that after a milestone year in business, now being in our tenth year of business, booking over 100 tours, and getting our first grant through the Canada Council of the Arts to expand our business, Spherical Productions wins Booking Agent of the Year at the Hamilton Music Awards, and we are very proud of this accomplishment, which means hard work does pay off! NOTE: the McIntyre Theatre Showcases were booked by the HMA head honcho, Jean Paul Gaulthier, as well, Brodie booked the Nov 17 HMA showcase at the Casbah, and Marko booked the Nov 17 HMA showcase at Club Absinthe. I would recommend everyone who is interested in checking out more than one HMA showcase to buy the HMA wristband, they are $19.12, and they get you in to see any specific acts in any of the venues on Nov 16 and Nov 17, so I suggest to get a wristband, look at the acts below, figure out every act you want to see, and make the night an adventure, since all the venues are walking distance throughout downtown (except McIntyre Theatre), and if driving, please don’t drink and drive or have a designated driver. NOTE: festival wristband gets you into the Crowbar show!!! 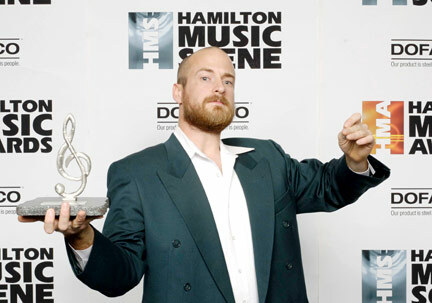 Spherical Productions is proud to say that 3 of our artists are up for Hamilton Music Awards, CA Smith is up for 4 awards, including Male Artist of the Year, Alternative/Indie Rock Recording of the Year, Songwriter of the Year, and Video of the Year, Wax Mannequin is up for Male Artist of the Year and Roots Recording of the Year, and Blind Mule is up for Alt/Country Recording of the Year. SP is so proud of these amazing acts, and hope they take away some awards for all their hard work and great talent! The Donefors are touring throughout the East Coast! The Donefors are at it again, recently receiving a tour grant from the Canada Council of the Arts, so Spherical Productions put together an East Coast for them, and as of Wed, Nov 7, they are touring throughout the East Coast, starting in Montreal, going into Edmundston, Hampton, Fredericton, Moncton and Halifax, along with some Southern Ontario dates. 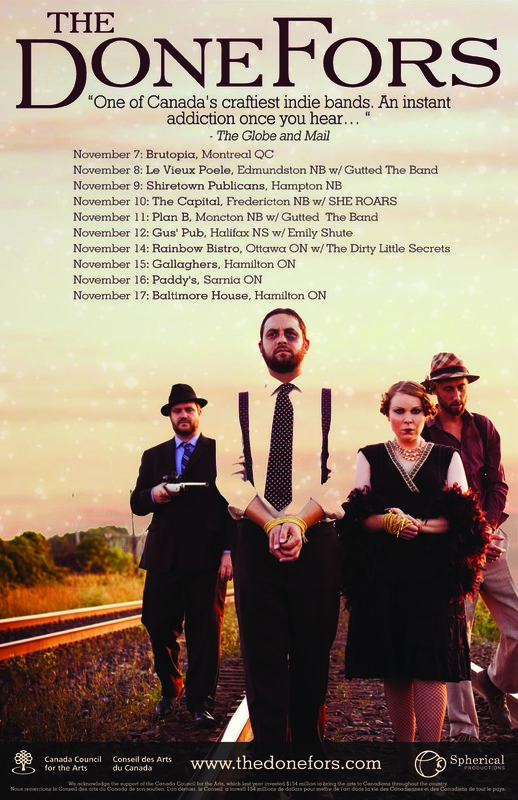 Here are their tour dates..
11/10/12: The Capital, Fredericton NB w/ SHE ROARS! Make sure to check them out if you are in one of the cities/towns above! Tonight is the night that Blind Mule & Must Stash Hat release their long-awaited albums, with special guests Planes & Trains, and this is all going down at This Ain’t Hollywood in Hamilton, and all 3 acts are super stoked for this night, and hoping you folks will make it out to support them on this special night! 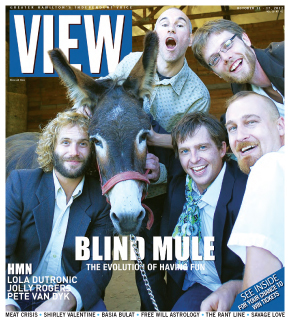 … and to top it all, for the last issue of View Magazine, Blind Mule got the front of View Magazine, in support of this show, check out the interview here ..